These people waited in line for hours to get free grilled fish at the Sanma Festival. 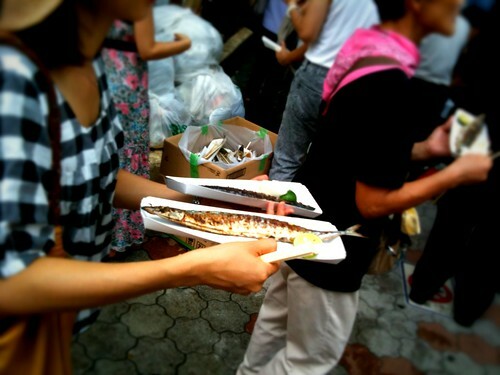 About 5,000 sanma (Pacific saury) were given away. And they remained in line to get their lime and grated radish. Continue reading Free Fish! Posted on September 6, 2010 September 22, 2011 Categories community, events, japanTags aquaculture, fish, meguro, Pacific saury, Sanma Festival1 Comment on Free Fish!